I’m not quite what you’d call a tramp, but I’m working on it; however I am usually late, even for the theatre. I don’t arrive late to be noticed ‘in ermine and pearls’, as in the song; I just get the timings wrong; horologically challenged, I guess. On January 30 I was almost late for the Édith Piaf show in the Bord Gáis Energy Theatre Dublin; was stuck out at RTÉ Radio, doing an interview with The Bugle Babes, a 1940’s harmony trio. My car had broken down, and I had just downloaded the Hailo app, and was enjoying the thrill of it so much but, alas, as Steven Berkoff said, taxis were thin on the ground that night. Luckily, I got a lift with the producer of the RTÉ show; Piaf! Le Spectacle was starting at 7:30 and I got there at 7:29; on entering the theatre, someone called my name; it was my accordéoniste, my companion for the evening, whom I had just walked past, not recognising her in her evening look: tanned and relaxed, with hair and make-up done. Édith Giovanna Gassion, was born in December 1915 in Ménilmontant, a poor part of Paris; when her mother went into labour, it is said she gave birth to Édith on the cape of a passing policeman, beneath a lamp-post, outside nº 72 Rue de Belleville. Shortly after, her mother, Line Marsa, a cafe singer and drug addict, abandoned her, and she was brought up by her paternal grandmother, who ran a brothel in Normandy. Last year being the 100th anniversary of La Môme Piaf’s birth on that cold December day, a number of Piaf tribute shows have been popping up. It was my understanding that the Piaf show in the BGET was from the West End, a 1980s version, and I expected to see a faux-inebriated, emotional singer on the stage, wrapped in a pink feather boa, clinging to a lamppost, with a glass of vin rouge in hand, her make-up melting like a Kraft Single in the microwave. It couldn’t have been more different; it was classy and refreshing; the timing and scene changes were perfect, and I didn’t leave after the first half, which I usually do; well, I never would for a Piaf show: the chansons are too merveilleuses. The less-is-more staging set the scene: Édith’s life was so complicated and colourful, it is hard to cover all of it in one show. The scenes in the first half set out to represent the first part of her career - street singing and café performances – with a lamp-post, a street bench, tables and chairs, and some gorgeous images of the Paris of the 1930s and 40s on the back wall. There was no text in the show and the songs came back to back; quite similar in fact to the way Piaf herself performed. The musical backing was provided by four wonderful musicians: piano, double bass, percussion and accordion. The show opened with a superb minor-toned arrangement of Sous le ciel de Paris played subtlety by the virtuouso accordionist. My friend and I argued during the interval as to whether the accordionist was improvising or if the music was arranged; I said it was arranged; she said it was improvised: no way could all those notes be written down. And I enjoyed watching the wondrous images at the back, which I usually think are a bit of a tacky move, an unnecessary distraction; after all the audience should really be intrigued by the singer and the band; however, these were classic images. 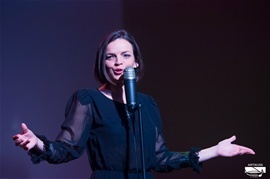 Anne Carrere is of course French and she sang very like Édith: tight, fast moving vibrato and low range; her physique is similar, although she is not as tiny (1.42m); how the producers of this show must have thanked their lucky stars when Anne walked in to audition as Piaf: they cast her straight away. I thought she sang a little on the strong side during the first half (over-amplification, perhaps?) where she would have benefited from some shading. On her website, there are videos of her singing on the streets of Paris in that same strong loud voice; Édith sang in a similar way when she was starting out, in order to be heard too, I guess. But when Piaf hooked up with lyricist Raymond Asso (who resurrected her career after Louis Leplée was murdered in 1936) he got her to use gestures and expressions and to vary her tone; while Leplée discovered Piaf, Asso made her a star. Unusually, most of the songs in the first half of the show under review were not her big acclaimed numbers, though Autumn Leaves was there, again supported magnificently on accordion. The band was super tight, impeccable; but the scene stealer was the accordéoniste, the quintessential instrument of the la chanson réaliste: it’s the street answering back, the sigh from the shadows, the tone of the era. The second half of this spectacle was geared to reflect Piaf’s career in the sense of iconic, world-wide success. During the war years, and after, she and Frank Sinatra were two of the most popular singers, and I wonder if Édith and Frank ever met, when she was singing in New York and, if they had, would he have got a kick out of her, would her French charms that had worked on so many men (including the high profile, handsome, very married French boxer, Marcel Cerdan) have worked on Frankie? - for although she was no Marilyn, she had her own unique street appeal. Anne Carrere’s microphone was one of these uber-modern things, which I personally don’t like and, to make it worse, it was hand held, so that she could remove it from the stand, and walk with it to the back of the stage; I even saw her give a couple of modern Beyoncé-like head shakes - a trait which should be nipped in the bud! Now I understand that this makes staging more interesting; perhaps, but...it’s a modern thing, and Piaf is vintage 1930s/40s/50s and that involved standing in the one spot at the mic, or moving over to the piano and singing without amplification, which Piaf did. The most interesting part of the evening was when Mlle Carrere sang for a short while away from the mic, encouraging the audience to sing along; she certainly had the lungs for it, and proved she didn’t need all that over-the-top amplification; it was really chilling, and I would love to have heard more.